Scarf measures 5 ½" x 63". Hat fits all. RED HEART® "Hokey Pokey™", 100% Acrylic, Art. E718 (4 ounce skeins): One Skein each No. 7110 Spearmint CA, No. 7112 Robins Egg CB, No. 7111 Blue Bonnet CC, No. 7113 Periwinkle CD, No. 7106 Light Plum CE, No. 7107 Bubblegum CF, No. 7108 Tangerine CG will make two Scarf & Hat sets. 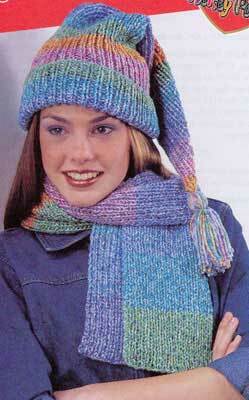 Scarf: 6 ounces color desired. Hat: 4 ounces color desired. Knitting Needles: 6mm [US Size 10]. GAUGE: 24 sts = 4"; 18 rows = 3 ½" in rib pattern. CHECK YOUR GAUGE. Use any size needles to obtain the gauge. With CA, cast on 33 sts. Row 1 (Right Side): K1, * P1, K1; rep from * across. Row 2: P1, * K1, P1; rep from * across. Rep Rows 1 and 2 for pat and work 16 more rows with CA, then work 18 rows each with CB, CC, CD, CE, CF, CG and repeat colors in this sequence until CD stripe has been worked 3 times. Bind off in ribbing. With CA, cast on 89 sts and work in rib pat same as for scarf for 6 rows, then work 6 rows of each color in sequence as described for scarf until 8" from beginning, end wrong side row. Shape Top: Keeping continuity of the 6-row-color sequence, dec 1 st each end of every right side row until 5 sts remain. Next Row: Slip 2 sts knitwise, K3tog, pass the 2 slipped sts over - 1 st. Bind off. FINISHING: Sew back seam. Make a tassel using all colors: wrap yarns around a 5" -wide cardboard 8 times. Cut wraps at one side of the cardboard, tie wraps at opposite side. Tie a length of yarn firmly around all yarns ¾" down from center tie. Trim ends. Attach to tip of hat. ABBREVIATIONS: dec = decrease; K = knit; mm = millimeters; P = purl; pat = pattern; rep = repeat; rib = ribbing; st(s) = stitch(es); * = repeat whatever follows the * as indicated.